EUR/USD Forecast: Can it weather the trade war? New US tariffs on China weigh on markets but EUR/USD weathers it. The NATO Summit is a lot more than about security. The technical picture is now balanced for the pair. The EUR/USD is slightly lower on the day, but the moves pale in comparison to the downfall of commodity currencies. The US has published a list of $200 billion worth of Chinese goods that it wants to target. The $200 billion sum is around six times the tariffs imposed on Friday and serve as a major escalation in the trade wars. China said it will retaliate yet its total imports from the US do not reach this vast sum. They could respond to higher duties against the 10% planned US tariffs, with non-tariffs barriers such as regulation, with limiting tourist visits to the US and other measures. The new 10% tariffs are a response to China's retaliatory tariffs and are set to take effect only in two months. However, markets are moving already now with downfalls in Asian stocks and smaller effects in other financial markets. US President Donald Trump arrives in Europe for the NATO Summit. Ahead of the event, Trump complained against Europe's underspending on defense, less than 2% of GDP agreed by the members of the alliance. He also tied security to trade relations. The last encounter between Trump and his European counterparts was in the G-7 Summit that ended without a communique. Another clash is likely now and may exacerbate the reaction to the American tariffs on China. Trump made headlines in the wake of the Summit by saying that "Germany is a captive of Russia", adding to the unpleasant tone. It will be interesting to see how the event concludes. On Tuesday, the German ZEW Economic Sentiment came out below expectations, weighing on the common currency. Concerns around trade were cited by the German institution. Today, ECB President Mario Draghi delivered opening remarks at the Bank's Statistics Conference and did not refer to monetary policy. Later in the day, the US publishes the Producer Price Index, which serves as a warm-up to the Consumer Price Index due on Thursday. Prices for both consumers and producers are expected to rise. All in all, anything trade-related will likely have a broader impact than economic data today. 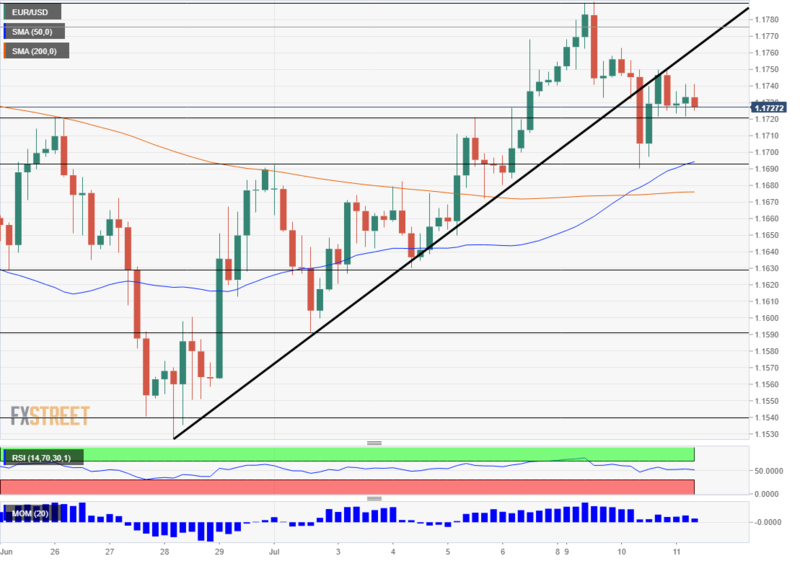 The EUR/USD is trading below the broken uptrend support line but still above both the 50 and 200 Simple Moving Averages on the four-hour chart. Momentum is near flat and so is the Relative Strength Index. All in all, the pair is looking for a new direction. Support awaits at the July 10th low of 1.1690, followed by the July 4th low of 1.1620 and the July 2nd low of 1.1590. Looking up, resistance is at 1.1795 which held the pair down on July 9th, 1.1850 which was the high point on June 14th and the January low of 1.1915.